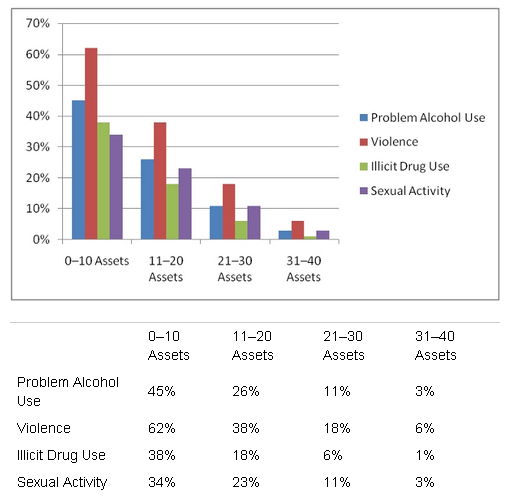 Search Institute  has compiled a list of 40 Developmental Assets that may protect youth from high-risk behaviors while promoting positive attitudes and behaviors. I don't know how valid the research is, but I found the list to be interesting and the data to be fascinating. Each of the 40 assets remain the same for each developmental stage while the application of assets change based on the age of the child. They're worth a look. I took a particular interest as I have a son in each of these developmental stages. Suffice it to say, I have some reading to do. 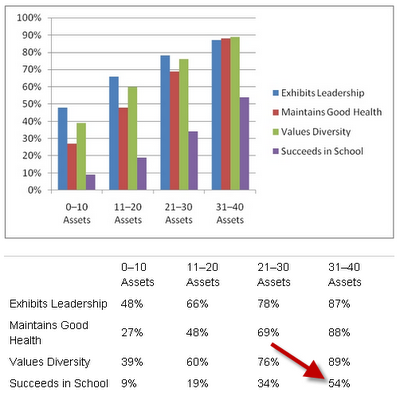 When I first saw this chart, I thought, "Man, I gotta get my kids 31 of these assets." But then, when I saw this chart I thought, "Holy, crap. We're doing something really wrong." Figure it out in the comments, will ya? I have no idea if this is even a credible organization. I learned about this today at a meeting I attended and it was the one thing that didn't make me want to stab myself in the eye with a pencil.